Two weeks ago I published a blog post, describing the first day of the Indian-German wedding in Lucknow, where I was a guest in November last year. Today I would like to continue a beautiful story of hearts and families bonding. 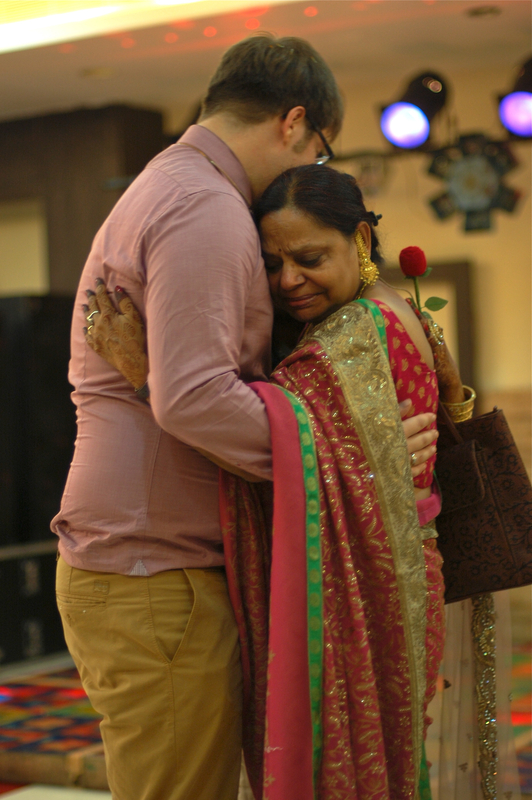 Even though there was still one day to go before the main wedding ceremony, the day when Haldi ceremony and Sangeet were performed felt to be the most emotional: at some point main participants of the rituals could not keep their feelings inside and you could spot tears in their eyes. Besides emotions, however, the day was full of singing, dancing and simply real fun, to experience which it would be absolutely worth coming to India even if just for a day! In the morning after the cocktail party, which had taken place a night before I, surprisingly, felt considerably better than after my flight, but dragging myself out of bed was no easier. On my way to the bathroom with my hair messed up and eyes half closed I realized that even 9 am wasn’t early for the bride’s family: as well as previous morning, the house was already full with nicely dressed ladies and bride’s parents were preparing for another ceremony. The bride, all dressed up in a gorgeous red sari and with her hair done, was enjoying a cup of morning chai and waiting for rituals to begin. The day was starting with the welcome and worship of ancestors, who were invited to attend the wedding. The family set up a “house” for ancestors, which was “planted” in a pot. Ancestors were generously offered food and water as they were to stay with the family till the end of the wedding. In the picture below you can see Mama and Papa of the bride grinding lentils with a stone, in a traditional way. A lot of respect is paid to ancestors during Indian weddings (in fact, not only during the weddings! ): they are always present and they are sending blessings to the new family. Like in “Sleeping Beauty”, it is very important not to make ancestors upset and show enough respect: otherwise a bad omen is unavoidable. After the ancestors worship a small “altar” for the bride and the groom was set up and all was ready for a Haldi ceremony to begin. All the objects had symbolic meaning and mostly were involved in the rest of the rituals, including the main wedding ceremony. Thus, one of them, kalash (a colorful pot) will be filled with water, coconut or mango as a symbol of wealth and the origin of life. Moreover, kalash is said to be a symbol of the respect to Gods witnessing the wedding ceremony. In old times Haldi ceremony was a beautifying ritual for a groom and a bride: their bodies were fully covered with a paste made of turmeric, rose water and precious sandal wood. This mixture was supposed to give a gorgeous glow to the skin and add a final touch to their beauty before the Big Day. Traditionally, the ceremony would be performed separately for a bride and a groom and they would not meet each other until the actual wedding. Nowadays the rituals are performed in a rather symbolic way. It was hard to say how familiar German guests were with the ceremony, but without a doubt they enjoyed it to it’s fullest – seriously, when else will you have a chance to smear your friend with an exotic yellow paste and be only encouraged to put more! The couple was truly enjoying being beautified by their friends and family. At the end of the ceremony feet of the bride and the groom were washed with milk and roses. Besides being exceptionally beautiful, this moment can also become quite emotional: in India, children always touch feet of their parents as a sign of respect, and during the wedding it happens the other way around for the first time. The whole ceremony was accompanied by the sound of drums and traditional wedding songs, which were sung by women of the bride’s family . That was the moment when I promised myself not to go to any other Indian celebration until I’m able to understand Hindi, as they say that to understand a soul of the nation one should understand it’s folklore. Full of emotions and impressions after the Haldi ceremony I could not possibly imagine that the night prepared even more! “Sangeet” is a Sanskrit word for music and in the language of modern weddings it means a dance party. Usually, it is a night before the wedding, when family and friends come together once again to dance, perform, enjoy music and simply have lots of fun. Sami’s and Chris’ Sangeet kicked off with a real show, where main traditional dances of India were performed (Bharatanatyam, Kathak and folk dances). Being a true admirer of this type of art I couldn’t take my eyes off, as this level of professional dancers can rarely be enjoyed abroad. And here comes the bride! When dancers were taking breaks, I used those minutes to stalk the bride, as I couldn’t decide what stunned me more: an ancient art or a bride’s outfit. After looking at her gorgeous sangeet sari I could not imagine anymore what she would wear for the wedding. However the absolute highlight of the evening was not the professional dancers – the couple had prepared a special treat which made the jaws of all guests drop. And no, it was not a valse dance, even though the first minute it was exactly what we all thought. The bride and the groom put up a real 15 minutes Bollywood show, which in fact was a love story, told by Indian and German songs combined. They said it took them 2 days and a lot of inspiration to do it, but it was hard to believe – or may be both of them are just fantastic dancers, who kept their talent in secret! Their dance sparked a lot of feelings which I still can clearly feel through this picture – family members were deeply touched with the performance that united two so seemingly different cultures through dance and emotion. 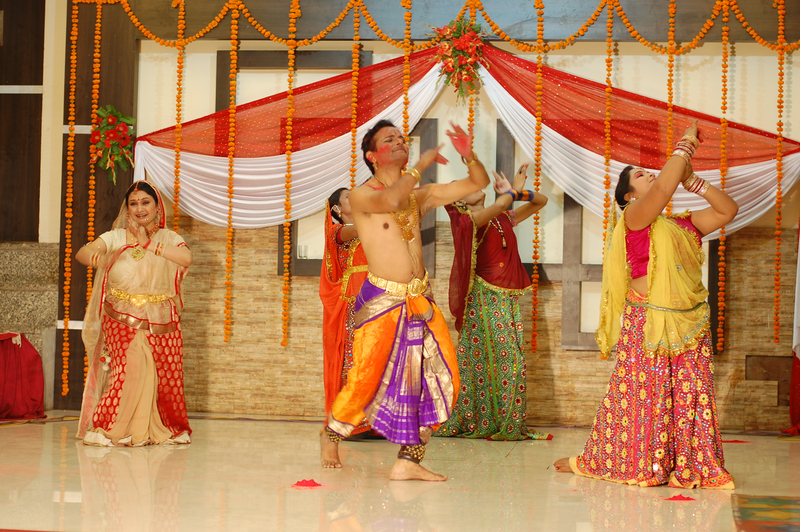 Indian weddings are a new experience to me, and that is why it is quite possible that I wrote a slightly different interpretation of the rituals performed. I would like to apologize for any possible inaccuracy in the description – please feel free to correct me.